Craft cider isn’t just for drinking! There are more and more food artisans including cider in their edible creations, a trend we’ll examine in this column, “Made with Cider.” Know of something we should highlight? Reach out to us at cheers@ciderculture.com. Cheese and cider have always been friends. The acidity and sweetness of cider is the ideal companion for the buttery richness of cheese, whether that’s a smooth and creamy young goat chevre or a crumbly, aged cow’s milk cheddar. The characteristics of cider and cheese go together so well, in fact, that some cheese makers have taken to washing cheeses with cider, thus melding the two together in eternal harmony (at least until the cheese gets eaten). One beautiful example of this is Jasper Hill Creamery‘s washed-rind soft cheese, Willoughby. If you care at all about good cheese, chances are that you’ve heard of Jasper Hill, a farm, creamery and cellar located in Greensboro Bend, Vermont. What you might not know is that Willoughy is actually a whole ongoing cider washing program. In the past, Jasper Hill has done editions with Eden, Shacksbury, Wölffer and Citizen Cider as general releases for its customers, as well as custom washes for specific events. We asked Jasper Hill’s marketing manager, Zoe Brickley about how the cheese makers at Jasper Hill use cider for washing cheese, and about how they choose specific brands to use with this cheese. She explained that Willoughby is a pasteurized cheese. While Jasper Hill is known for making raw milk cheese, this one needs to be shipped to customers before it’s been allowed to age for the Federally-mandated 60 days, so it must be pasteurized, in this case, by necessity rather than by choice. She also notes that while the hoppiness of beers can tend to lend unwanted bitterness to a washed-rind cheese, cider is different. It nearly always makes a pleasant compliment. “Cider is usually a really nice pairing with cheese, so that’s kind of an easy bet. It’s like saison fruit beers are great and cider is kind of like that on its own,” she says. Willoughby is sold in an eight-ounce wheel, and with its gooey, pudding-esque interior it boasts aromas of peat, roasted beef and onions — “a strong and complex front for the subtle milky, herbal, ripe-peach flavors within,” according to Jasper Hill’s website. It would make a delightful pairing with a funky farmhouse cider or a juicy rosé cider. She also explains that instead of using finished cider, Jasper Hill often uses the lees from the cider making process, which Brickley says cider makers love because, to them, lees are a zero-value product. 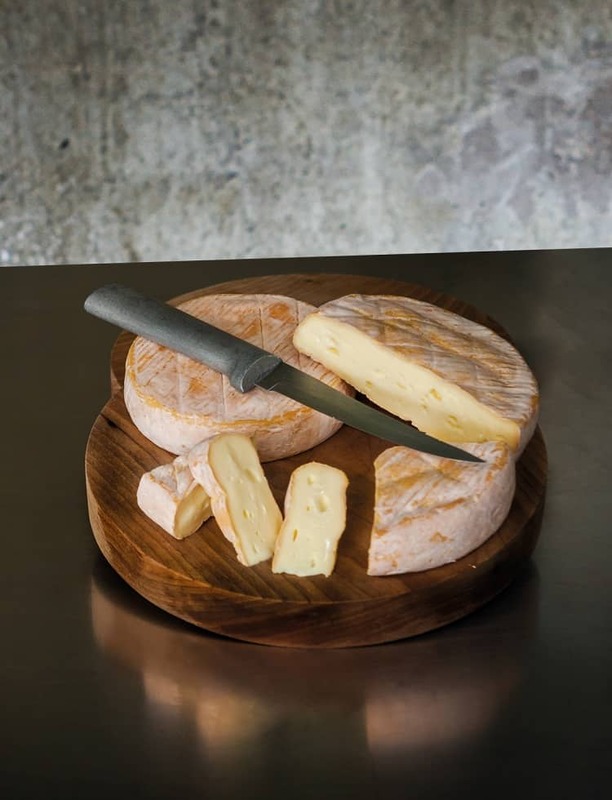 The viscous, sludgy lees are painted onto the cheese until it creates a thick layer. “In the case of Willoughby, we keep washing it and it develops an orange, sticky washed rind; it’s a bacterial community as opposed to a yeast and mold community like on a bloomy rind,” she says. In addition to creating flavor in a more subdued cheese, Brickley notes that doing special washes of Willoughby is a powerful tool for helping Jasper Hill to place the cheese in the market. “It makes a connection with the customers,” she notes. “So, somebody like [the buyer for] a Whole Foods region might commit to buying 500 pounds and, in exchange, we’ll wash it with whatever they want. Usually they send us some options of what they like, and we narrow it down.” She recalls an instance where Whole Foods chose a run of Willoughby washed with Citizen Cider, because it allowed for great cross-promotion which actually did result in very high sales of both the cheese and the cider in stores. This September, Keep an eye on your favorite cheese shop (you know, the kind that employs cheese-mongers who like to nerd out on cheese) for the newest special release of Willoughby, made with Shacksbury, another Vermont-based producer. “They’re our buddies and they had the Lost & Found cider lees, and that really fits into the spirit of what we try to do with cheese,” Brickley says. “It makes a connection with the customers” – in more ways than one! Anyone who appreciates wine, craft beer, and/or craft cider is given the opportunity to appreciate that same passion for our beloved farms and ‘craft cheese’!